This was a great match for Kawato! He spent the moajority of the time in the ring for his team, going against both Sabre and Desperado at different times. Ibushi and Sabre faced off for a decent amount of time prior to their A Block match tomorrow, but Kawato was the star here. He survived a lot of Desperado’s attacks and came close to getting a pinfall a couple of times. It feels like he’s going to move up sooner rather than later. This was a very nice opening match. Good match. The competitiveness between Makabe and Ishii and between Nagata and Goto got fairly intesnse as this match went along. Both of those pairs face each other tomorrow in A Block, so this was a good preview of those matches. I especially liked Goto and Nagata going at each other. Their match tomorrow might be surprisingly brutal. Tiger Mask and Gedo entered the match late, but their segment was a lot of fun. They added some lightness and comedy to an otherwise hard hitting match. A pretty good match. Finlay and Tanahashi worked pretty well together for a while, but this match really felt like four individual efforts. Fale and Tanahashi have a match coming up, but they didn’t seem to interact a whole lot. Finlay took the brunt of the damage for his team. Good match. I liked how this one built to a fairly frenetic finish. LIJ worked great as a team as usual. They were easily the better team here, but YOSHI-HASHI’s aggressiveness gave his team a chance. No particular moment really stood out, but this was just an overall entertaining and well-paced match. Very good match! It seemed to get a little slow towards the middle, but the final segments of this match were great! Kojima looked great throughout, but this was a huge match for Robinson. I’ve never been that big of a fan of his. I like him alright, but this is going to make me really pay attention to him going forward. The final few minutes of this were legitimately intriguing and surprising to me. Good match. Tama Tonga started the match trying to use his speed to throw Elgin off his game. He literally ran circles around Elgin at one point. Elgin wouldn’t be thrown off though. He started to dominate the match and controlled the pace for a long time. Elgin got pretty methodical with this one, but TOnga looked good. He picked his spots and had some nice impact that way. Great match! Even though they are both members of Los Ingobernables de Japon (or maybe because of it), this fight got dirty very quickly. The first portions of the match were fought almost exclusively outside the ring. Chairs and barricades were used, and neither guy seemed to hold back much. There were also some very big moves hit, a trend that would continue throughout the match. This was very competitive, and the final sequence was pretty spectacular. This was fun. Yano brought the comedy, and Okada, Jado, and Gedo were all game to have fun with this one. It never really got too serious, but it wasn’t so goofy that it wasn’t believable. This was a good start of the tournament for both guys. I also think this match was well placed on the show. It gave a little levity right before what everyone expects to be a crazy match. Fantastic match! Omega started this match by selling his apprehension at facing Suzuki. He wouldn’t even look Suzuki in the eyes as they were announced in the ring and Suzuki got right in his face. Suzuki seemed unstoppable at first. He hurt Omega pretty bad, injuring Omega’s leg which played a role in the rest of the match. There were also some shenanigans when Suzuki Gun (El Desperado, TAKA Michinoku, and Taichi) came out to attack when the ref got knocked out, but Bullet Club (Chase Owens and Bad Luck Fale) evened the odds. The match could have ended around that point, but it went on much longer. Omega and Suzuki beat each other up, and both men showed great resilience and skill. This match had a little of everything, and it was great. This was another great show and a superb start to B Block. This show had lots of nice surprises by some guys that I didn’t expect much from, and the action was top-notch all around. Before this match started I was thinking that EVIL vs SANADA was going to be the best, but Omega and Suzuki really brought a lot to their match. 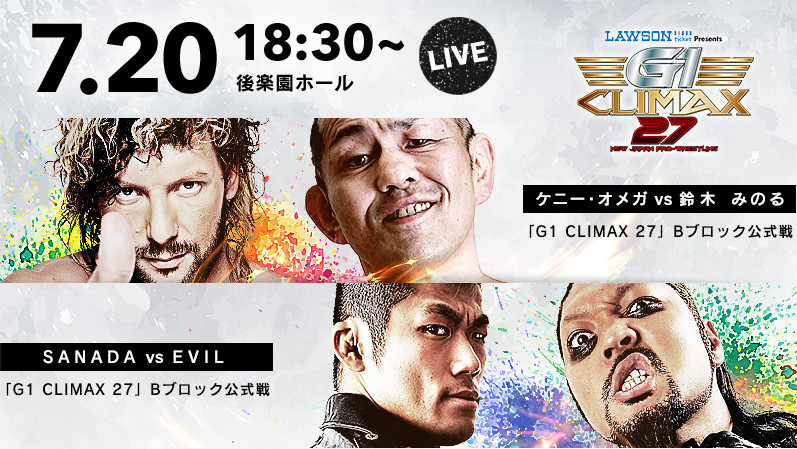 TAGS: Bad Luck Fale Bullet Club Bunkyo Tokyo Japan Bushi Chaos Chase Owens David Finlay Don Callis El Desperado EVIL G1 Climax G1 Climax 27 B Block Match G1 Glimax 27 Gedo Hirai Kawato Hirooki Goto Hiroshi Tanahashi Hiroyoshi Tenzan Jado Japan Juice Robinson Kazuchika Okada Kenny Omega Kenta Sato Kevin Kelly Kimihiko Ozaki Korakuen Hall Kota Ibushi Los Ingobernables de Japon Makoto Abe Marty Asami Michael Elgin Minoru Suzuki NJPW Red Shoes Unno Sanada Satoshi Kojima Shigeki Kiyono Suzuki Gun Taichi Taka Michinoku Tama Tonga Tetsuya Naito Tiger Hattori Tiger Mask Togi Makabe Tokyo Japan Tomohiro Ishii Toru Yano YOSHI-HASHI Yuji Nagata Yusuke Okamoto Zack Sabre Jr.